This weekend my family piled in our SUV and drove 6 hours to Mammoth Mountain (3 stops for bathroom, food, and throw up included). We had a fabulous weekend of family bonding and exercise. Skiing with kids was fun and an incredible learning experience. Here are the top 10 lessons I learned skiing with my boys. 1. Layer up – Be prepared for extreme weather from very cold to sunny CA spring skiing. Multiple layers that are easy to peel on and off will help your child feel comfortable and prevent over heating or frost bite. 2. Rent or borrow – Kids grow fast so consider renting child appropriate equipment such as skis, helmets and boots. One blister can ruin an entire trip so make sure boots fit properly and socks won’t slip down. Clothing can be borrowed, as long as it’s comfortable and the outer layer is water-resistant. Pajamas and thermals make a good under layer when it’s cold. 3. Helmets – Broken limbs can be fixed, but broken heads can cause serious lifelong issues and even death. Teach your children to protect their brain and ALWAYS wear a helmet. Be sure to role model safe behavior yourself. 4. Sunscreen – In addition to the sunrays from above, the sun also reflects off the ice so it’s doubly important to wear sunscreen and reapply often. For younger ski school kids, meet your child during the day to help reapply. Eyes also need to be protected from both the sun and injury so cool ski goggles are a must. 5. Potty time – It’s not so easy to shed layers quickly when a child has to go….now! Try to prepare and have your kids use the restroom before gearing up and whenever they come in for a break. Even if they don’t have the feeling, ask them to try. 6. Learning lessons – Skiing can be dangerous and it’s important to learn the basics before you let your child hop on a chair lift and head to the top of the mountain. Unless you are an avid skier and enjoy teaching pizza, french fries, turns and stops, it’s wise to delegate the beginning basics to a trained professional. Plus, ski school is fun! 7. Snacks and water – Fill your pockets with tiny, energy boosting snacks such as nuts or a granola bar. Skiing is hard work so be prepared to refuel your kids when hunger strikes, even on the slopes. Small water bottles or soft water packs work well for hydration. Kids often forget to drink water when it’s cold outside, so remind them to take frequent water breaks. 8. 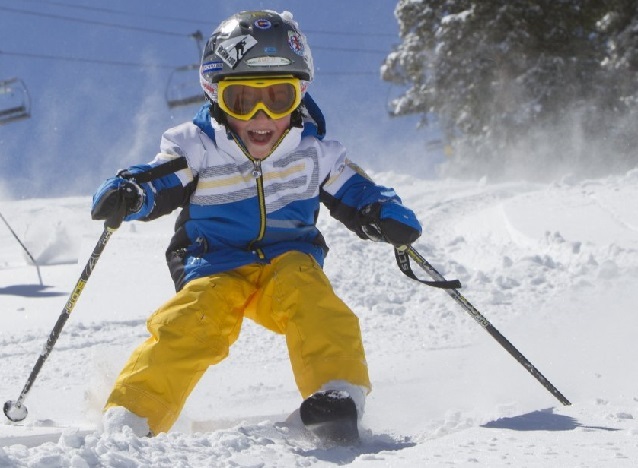 Safety – Teach your children ski safety. Be aware of other skiers and snow boarders around. Teach older children to always ski with a buddy and stay on marked trails. You can’t always count on cell reception on the mountain so have a meeting time and place to check in. 9. Acclimate – Snow itself can be very foreign to many children. Don’t rush to put your kids on skies. Spend time waking and playing in the snow, throwing snowballs, building a snowman and watching others ski. You just might have the best day of your trip. 10. Encourage – Prepare children for what’s ahead. Even gold medal skiers began on the magic carpet and practiced and prepared before their first chair lift and whoosh down the mountain. Provide encouragement each step of the way and make learning to ski fun. Like riding a bike, it’s a sport skill they’ll remember and enjoy for life! This post comes from the TODAY Parenting Team community, where all members are welcome to post and discuss parenting solutions. Learn more and join us! Because we.re all in this together.